The 2016 Lippincott Pocket Drug Guide for Nurses provides current, vital drug information "in a nutshell." Based on the popular Lippincott Nursing Drug Guide by Amy Karch, this handy pocket guide by the same author gives essential information on over 1,500 medications in an easy-access A-to-Z format. The "mini" drug monographs include generic and trade names, drug class, pregnancy risk category and controlled substance schedule, "black box" warnings, indications & dosages, dose adjustments, adverse effects, drug interactions, nursing considerations, and patient teaching. A special section reviews Patient Safety and Medication Administration. Appendices cover topical and ophthalmic medications, laxatives, combination products, contraceptives, biological agents (vaccines), and more. Also includes free online access to Monthly Drug Updates and a Toolkit loaded with hundreds of additional drug-related resources on thePoint. 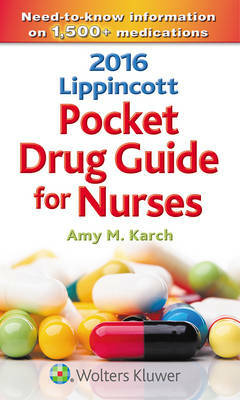 The pocket-sized 2016 Lippincott Pocket Drug Guide for Nurses will quickly become your go-to guide for important drug facts and vital patient safety tips and alerts.